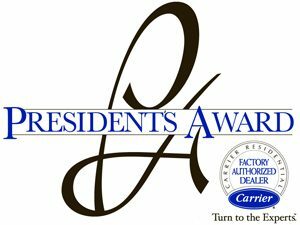 The President’s Award, Carrier’s highest honor for its dealers, is designed to encourage self-analysis and reward individuals who have excelled in customer relations. Its goal is to support business improvements and show gratitude for their customer loyalty. This award presents the opportunity for recipients to serve as role models, share “best practices” and otherwise offer peer mentoring to help cultivate excellence across the dealer group. “This year’s recipients achieved their business goals while delivering exceptional customer value and successfully positioning the Carrier brand in their respective markets,” said Karie Johnson, manager, Programs and Promotions, Carrier North America Residential. “Winners will gain access to more of Carrier’s programs and information. Moreover, they will be able to capitalize on publicity, marketing and merchandising opportunities that are unique to President’s Award recipients and therefore continue to shape, grow and succeed in their business,” added Johnson. For President’s Award Dealers, it’s your satisfaction–not just a sale–that counts. That’s why they strive to provide personal follow-up and quick, knowledgeable solutions to your home comfort problems. They also keep ahead of the industry with specialized training. All of this makes a big difference when you have to make big decisions about your home comfort.